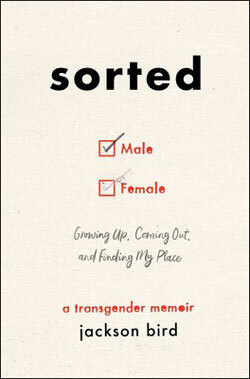 In honor of International Transgender Day of Visibility, Jackson Bird, author of SORTED, shares his advice on supporting the trans people in your life. Look for Bird’s debut book on the topic later this fall, and check out his YouTube channel on LGBTQ+ education. The best way to support the trans people in your life is going to vary depending on a lot of factors. What kind of relationship do you have with them? Where are they in their transition? The way you show support for a sibling is going to be very different from how you show support for a coworker. 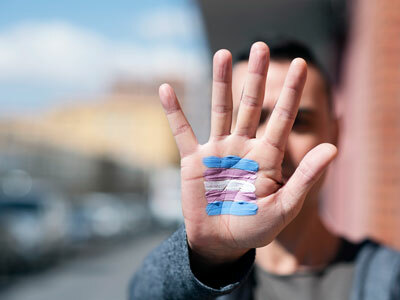 Likewise, a trans person who just came out might have very different needs from a trans person who came out and transitioned years before you ever met them. Whatever the case may be, the following five tips should serve you well in your first steps to becoming an ally. It’s natural to have a lot of questions when someone comes out to you as transgender. After all, our lives have been swept under the rug by the media, history books, and the government for generations. So it’s totally understandable that you might not know all of the right words or how different elements of transitioning work. While some trans people might be happy to explain a few basics if you ask politely, please remember that we’re not walking encyclopedias and that there are infinite resources online to answer your questions. It’s kind of like when you ask your Apple Genius Bar friend what’s wrong with your iPhone when you’re at a party. Sure they’ll probably answer to be nice, but you can tell they’d rather you just made an appointment like everybody else. Even when you’ve done your research, it’s possible there will still be some things you just don’t get. Maybe you’ve never heard of the gender your friend or family member has come out as. Maybe you think being trans is out of character for the version of them that you know. Whatever it is, trust that they have thought about this, from every angle, for far longer than you have. If you think they’re moving too fast and are worried about them making brash decisions, remember that, even if this is new information for you, it’s something they’ve likely been grappling with for years or even their entire lives. Trust that, and respect it––even if you don’t quite understand it. Many people have a new name and pronouns they start using when they come out. Unless they tell you otherwise, there’s no waiting period before adopting a person’s new name and pronouns. Once they tell you what their new name and pronouns are, that’s when you start using them. Not when they’ve started physically transitioning, not when they’ve legally changed their name and gender marker, just when they tell you it’s time. And a quick note on adjusting to someone’s new name and pronouns: You might mess up. In fact, if you’ve known them for a long time, you most certainly will. Don’t freak out! Don’t make it a big deal. Quickly correct yourself and continue on speaking. If you’re able to, pull them aside privately later to apologize. So long as you make it clear that you’re respectfully trying, most people will let a few slip-up’s slide. Not all trans people transition from male to female or vice versa. Some people identify as nonbinary, genderqueer, agender, bigender, and so much more. Some of them may adopt a new name and pronouns, some maybe undergo physical transition, and some won’t. There are so many ways to express your gender, no matter what it is. Take some time to learn about nonbinary genders and challenge yourself to think beyond the binary of male and female. It can help you realize how silly a lot of our gender-based social structures are––and help you be a better ally to trans people of all stripes. As I said before, it can be exhausting having to educate people and stick up for ourselves every day. You can do your part and use your cisgender privilege to take some of the weight off our shoulders. Be careful not to speak over or instead of trans people, and prepare to be corrected on occasion (after all no one can ever be an expert in something they haven’t experienced), but do what you can to amplify our voices and defend us when you can. Something as simple as requesting that people state their pronouns, as well as their names, at the start of meetings can ensure your trans coworker doesn’t get misgendered that day. Today, Jackson is a writer, YouTuber, and LGBTQ+ advocate living openly and happily as a transgender man. So how did he get here? In this remarkable, educational, and uplifting memoir, Jackson chronicles the ups and downs of growing up gender confused. Illuminated by journal entries spanning childhood to adolescence to today, he candidly recalls the challenges he faced while trying to sort out his gender and sexuality, and worrying about how to interact with the world. With warmth and wit, Jackson also recounts how he navigated the many obstacles and quirks of his transition––like figuring out how to have a chest binder delivered to his NYU dorm room and having an emotional breakdown at a Harry Potter fan convention. From his first shot of testosterone to his eventual top surgery, Jackson lets you in on every part of his journey—taking the time to explain trans terminology and little-known facts about gender and identity along the way. Through his captivating prose, Bird not only sheds light on the many facets of a transgender life, but also demonstrates the power and beauty in being yourself, even when you’re not sure who “yourself” is. 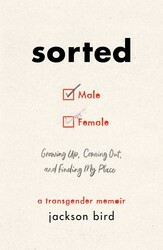 Part memoir, part educational guide, Sorted is a frank, humorous narrative of growing up with some unintended baggage.